11th lunar month of 1715: debut on stage (hatsubutai), at the Ichimuraza, where he performs as a wakashugata under the name of Tsuruya Genzô. 11th lunar month of 1719: Nanboku Magotarô I and his son Genzô respectively take the names of Tsuruya Nanboku I and Nanboku Magotarô II at the Ichimuraza, playing together in the kaomise drama "Tategami Teika Kazura". 1720: Magotarô becomes tôdori at the Ichimuraza. 9th day of the 9th lunar month of 1736: his father Tsuruya Nanboku I dies. 11th lunar month of 1736: Nanboku Magotarô II takes the name of Tsuruya Nanboku II at the Ichimuraza, playing the role of Tôkurô Morinaga in the kaomise drama "Izu Genji Hôrai Yakata", which celebrates the arrival in Edo from Kyôto of the actor Tomizawa Montarô I. 1st lunar month of 1737: Nanboku's rank in the Edo hyôbanki, dôkegata section, is jô-jô-(hanshiro)kichi (superior - superior - almost excellent). 11th lunar month of 1737: Nanboku plays at the Ichimuraza the role of the priest Mongaku in the kaomise drama "Genji Kumo Ôgi no Shiba", which celebrates the shûmei of Ichimura Uzaemon VIII; the others stage partners are Sawamura Sôjûrô I, Bandô Hikosaburô I, Kamakura Chôkurô II, Tomizawa Montarô I, Matsumoto Kôshirô II and Tamazawa Saijirô I. 1st lunar month of 1738: Nanboku's rank in the Edo hyôbanki, dôkegata section, is jô-jô-kichi (superior - superior - excellent). He shares this rank with Nakamura Kichibê I. 11th lunar month of 1738: Nanboku plays at the Ichimuraza the role of Akamatsu Kuyû in the kaomise drama "Mitsugibune Taiheiki". 1st lunar month of 1739: Nanboku's rank in the Edo hyôbanki, dôkegata section, falls to jô-jô-(hanshiro)kichi (superior - superior - almost excellent). 3rd lunar month of 1741: Nanboku's rank in the Edo hyôbanki, dôkegata section, falls to jô-jô-(shiro)kichi (superior - superior - (white) excellent). He shares this rank with Arashi Otohachi I. 11th lunar month of 1741: Nanboku plays at the Kawarasakiza in the kaomise drama "Konrei Sakae no Hachinoki". 1st lunar month of 1742: Nanboku's rank in the Edo hyôbanki, dôkegata section, falls to jô-jô-hankichi (superior - superior - half excellent). 11th lunar month of 1744: Nanboku plays at the Moritaza in the kaomise drama "Higashiyama Bandai no Watamashi". 1st lunar month of 1746: Nanboku's rank in the Edo hyôbanki, dôkegata section, is back to jô-jô-(shiro)kichi (superior - superior - (white) excellent). 11th lunar month of 1747: Nanboku plays at the Ichimuraza in the kaomise drama "Shusse Momijigari". 1st lunar month of 1748: Nanboku's rank in the Edo hyôbanki, dôkegata section, is back to jô-jô-kichi (superior - superior - excellent). He shares this rank with Arashi Otohachi I. 11th lunar month of 1753: Nanboku plays at the Moritaza the roles of Mura Gunzaemon and Muraoka Gorô in the kaomise drama "Masakado Kokyô no Nishiki", which celebrates the shûmei of Suketakaya Takasuke I and Ichikawa Sôzaburô II. 1st lunar month of 1754: Nanboku's rank in the Edo hyôbanki, dôkegata section, falls to jô-jô (superior - superior). 1st lunar month of 1758: Nanboku plays at the Ichimuraza in the new year drama "Kujûsanki Ôyose Soga". 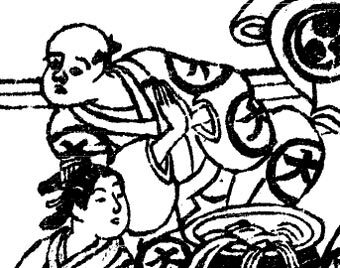 23rd day of the 12th lunar month of 1763: Nanboku dies in Edo. Tsuruya Nanboku II was an Edo actor, who was, just like his father Tsuruya Nanboku I, specialized in comical roles and made all his career in Edo from the midle of the 1710s to the end of the 1750s. Regarding his performances on stage, he was one of the most irregular actors in Kabuki history, reaching the jô-jô-kichi in 1738, losing this rank the following year, gaining it back in the 1st lunar month of 1748 and falling to jô-jô in the 1st lunar month of 1754.